It’s Pi Day! I’m not much of a math geek – in fact, I’m completely the opposite, but Pi Day means pies, so of course I had to make some. I purposefully made four tiny pies so I could cut into the last one and leave 0.14 of it. Get it?! 3.14 pies! These guys are a take on Hainanese chicken, my most favorite way of eating chicken ever. 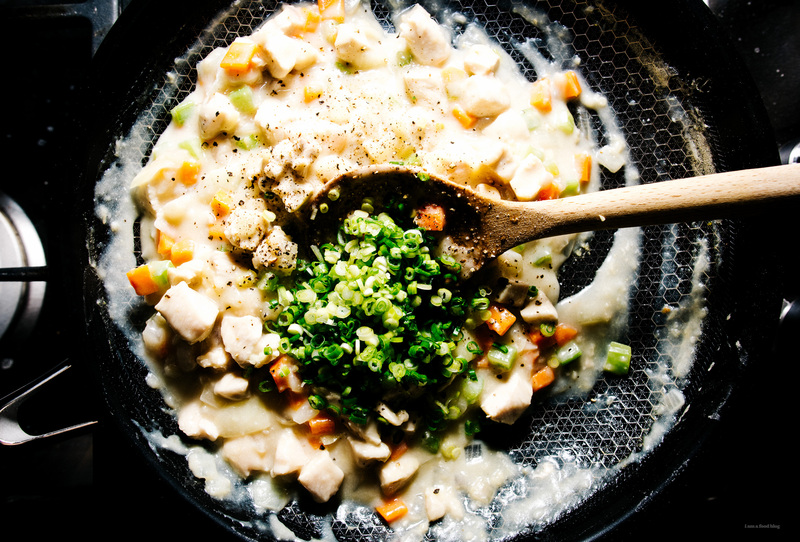 The basic flavors of Hainanese chicken are ginger, garlic, scallions so I added those to the regular aromatics of a chicken pot pie. 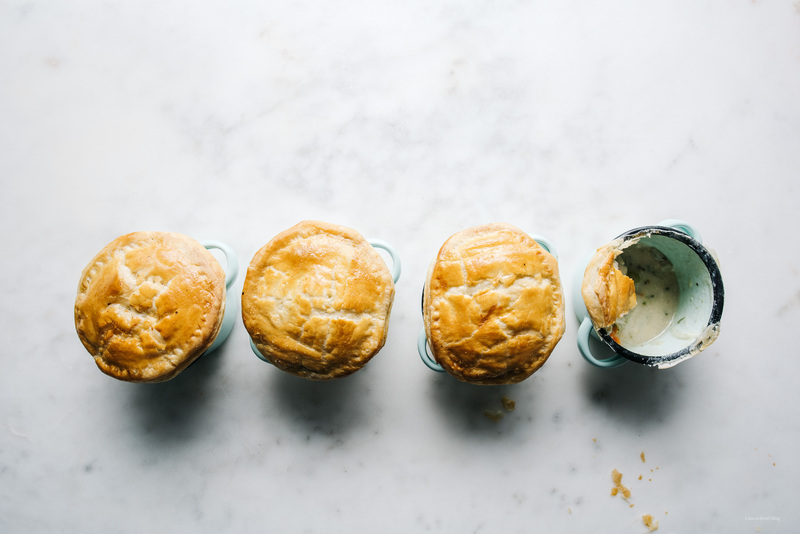 Topped off with a puff pastry hat, these pies are the perfect way to celebrate Pi Day! Melt the butter in a large, heavy-bottomed skillet over medium-high heat. Add the onion, shallot, ginger, and garlic and cook, stirring, until translucent, but not brown, about 5-7 minutes. Sprinkle the flour on and stir to incorporate. Pour the chicken stock in a thin stream into the skillet, whisking constantly. Bring to a simmer to thicken. Add the carrots, celery, and chicken. Simmer, stirring often, until the chicken is cooked through, about 10-15 minutes. 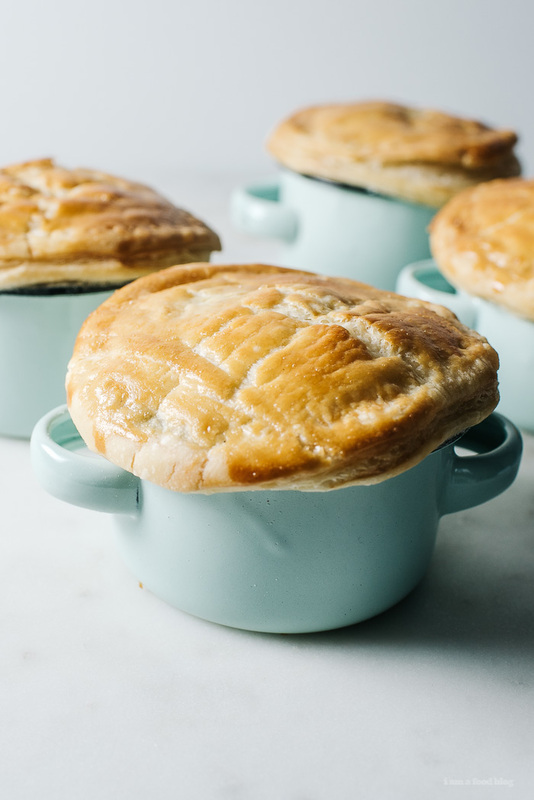 While the chicken is simmering, trim the puff pastry into circles a little bit larger than the baking dishes you’ll be using. When the chicken is cooked, stir in the green onions, taste and season with salt and pepper. Spoon equally into 4 mini baking dishes. 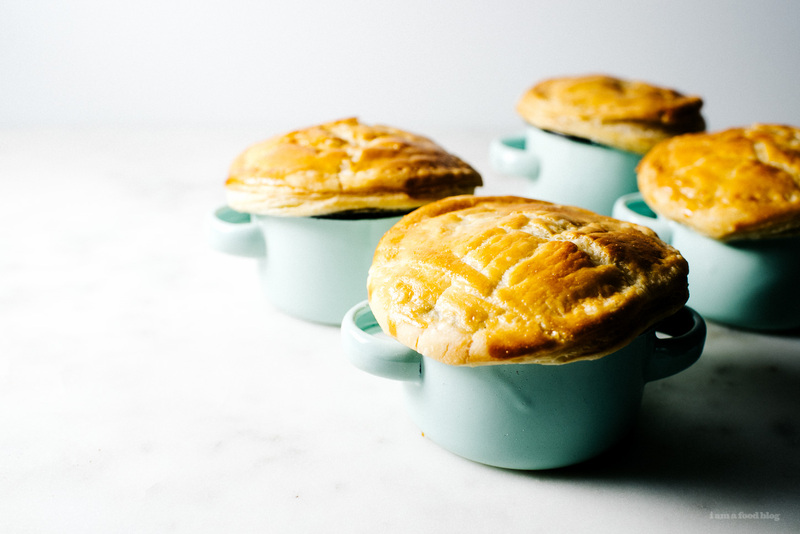 Top the baking dishes with the puff pastry and use a fork to crimp and adhere. Brush the tops with the lightly beaten egg. Place in the oven and bake until tops are puff and golden brown, about 20-25 minutes. Enjoy warm! Bite-Sized! 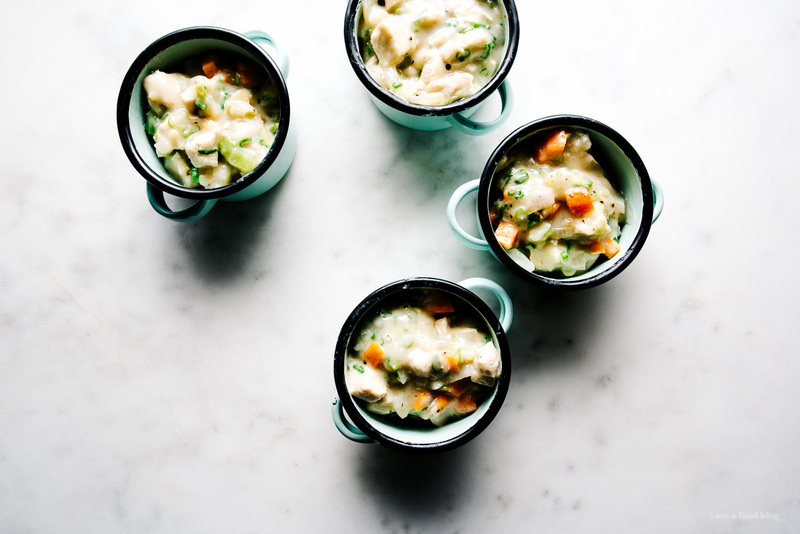 Bite-Sized is a recipe series that don’t have any deep and ponderous thoughts: they’re just yummy in my tummy and they can be yummy in yours too. They’re quick and easy recipes that I don’t have much to stay about, but I couldn’t go without sharing the deliciousness. I hope you give them a go! Hmmmm Hainanese chicken is such a childhood classic for me! 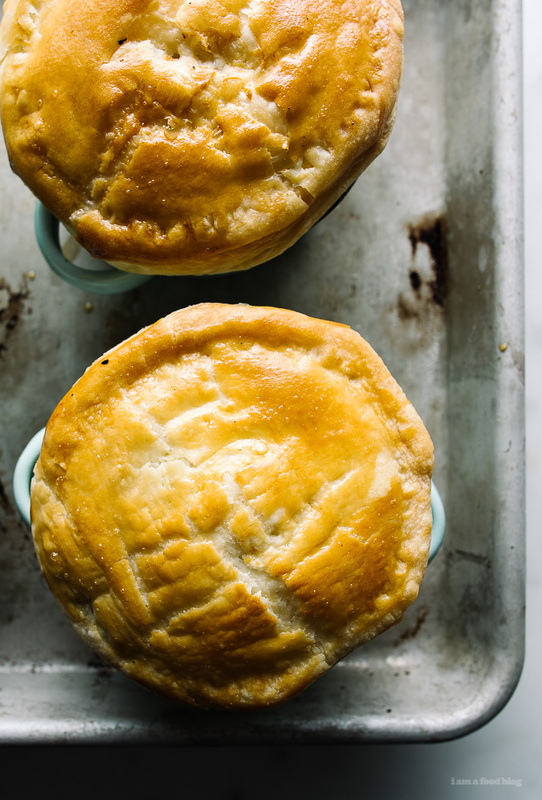 Love how you incorporated that into a pot pie. 😍 😍 😍 😍 😍 I can’t even! This is such an adorable idea! Love! I bought the same little turquoise enamel ramekins last week! Yay canvas home. Haha. These are so cute! I love the single servings. Using the eggwash on the puff pastry is such a great look, too! Another great recipe! Looking at your food blog around lunch time is torture! Looks great and I can’t wait to make it this week! Thanks again! OH your pies are soooo cute!! I want some now!! This is adorable! 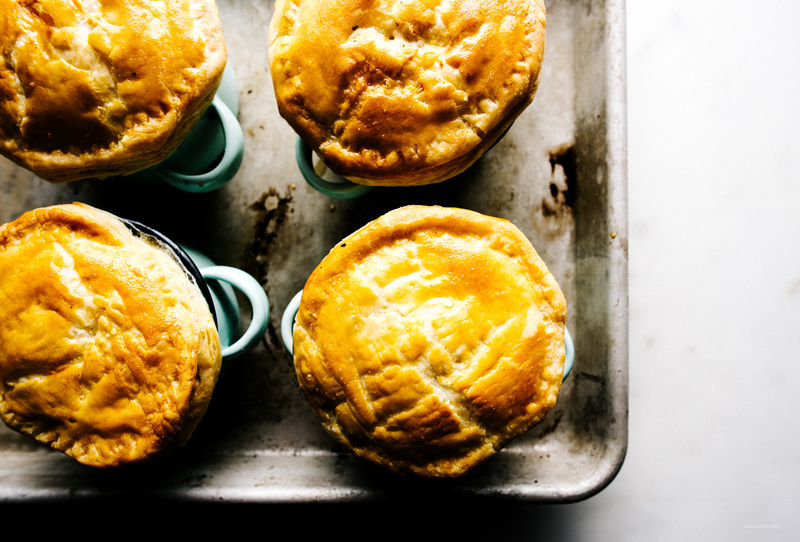 Totally forgot that today is Pi Day… might have to make these tonight for supper!! Thanks for sharing, and Happy 3.14!!! Such a cool twist on a comfort food classic! I’ll have to try this at my next potluck. What a great post! 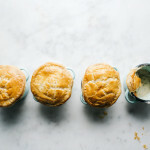 Loved your story and the mini pies look so good! I’ll have to try this! Wish I would’ve seen this on Pie Day! But I think everyday is Pie Day! This is slightly out of my comfort zone but I am going to try this, looks Good! YOURE SO CREATIVE! I love hainanese chicken too! I love this! It’s such a creative twist melding two classic dishes!